Know someone who is going through a divorce or separation, illness, or traumatic event in their life? 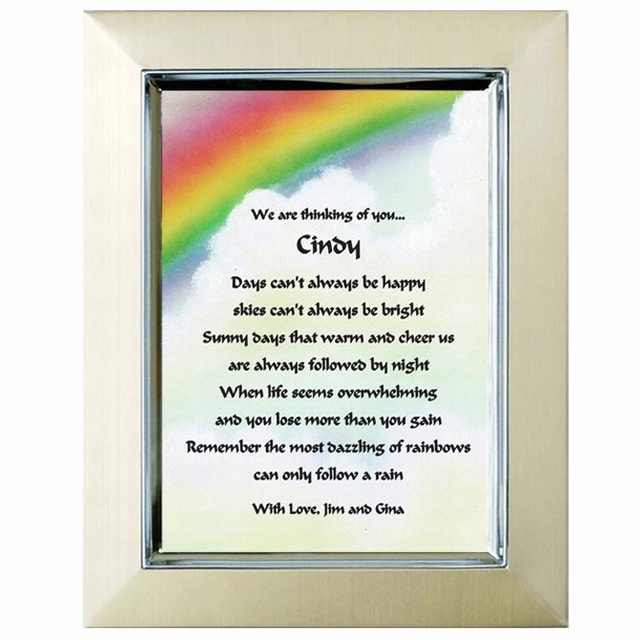 Let this personalized poetry gift comfort them and let them know there is a tomorrow. This 5x7 gold metallic frame can stand on any flat surface and can also be hung on a wall. Misfortune and hardships are sad but true parts of life. If you have a friend, brother, sister, parent, child or other family member who is experiencing the emotional pain that comes with a separation, divorce, the loss of a job or an illness, the comforting words in this Poetry Gift could be very helpful. Your thoughtfulness will surely be appreciated. 4 out of 5, Based on 3 Reviews. My friend lost her job and I wanted to lift her spirits and tell her things were going to be ok. This gift did just that.